Instructions for writing business letters so you can structure your cover letters using a correct format. Before we dive into the specific conventions of formal letter writing, keep in mind that there are a few accepted styles, and accepted styles can vary from country to country. The information here describes how to correctly format a block style business letter based on North American conventions for punctuation and spacing. Block style is widely accepted for writing business letters, and it is easy to format, so we'll stick with that style to keep things simple and avoid confusion. There are two ways to set up your contact information when writing business letters. You can use the standard format used for formal business letters, or you can use your resume heading style for your contact information. Notice the only punctuation is the comma after the name of your city. Instead of using the traditional format for your contact information, you can use the same heading that appears on your resume at the top of your cover letters. The advantage of using your resume heading on your cover letter is that it creates a consistent look for all of your job search documents (you can use the same heading on your reference page as well). When all of your job search documents are viewed together, they will look like a very polished and professional package. If you used option one, the traditional formal setup, for your contact information, leave one blank space between your contact information and the current date. If you used option two, your resume heading, to format your contact information, you may need to leave a few blank lines before the date depending on how the rest of the letter sits on the page. Don't worry about that until you have finished writing the entire letter, and you can see how it sits on the page. Write the date as month day, year. Notice there is a comma after the day. When writing business letters, you'll use a reference line if you are applying to a job that has a reference number. For example, if a job ad says something like, "In your cover letter, please note you are applying to job number 4537893." you will use the reference line to note the job reference number. From here on out, for the sake of simplicity, I'll just show the example using the resume header style for formatting the job seeker's contact information. When a job ad asks you to note a reference number, it is very important to put that reference number somewhere that is easy to see at a glance. Do not bury the reference number in the body of your cover letter. I would even suggest bolding the reference number to make it even easier to see. Why is the reference number so important? Usually jobs openings at large companies, or government jobs are assigned reference numbers in order to help direct the mail appropriately. When a job ad asks you to quote a reference number on your cover letter, I would go one step further and quote the reference number on the top of my resume as well. That way, if there is any kind of mix up when the company mail is sorted, and your cover letter gets separated from your resume, there is a much better chance that your resume will get sent to the correct person. Typically, the person distributes the mail is not the person who is reviewing resumes for the job opening. On top of that, there may be several different people in several departments hiring for different positions. Each job opening will have a different reference number, and the person sorting the mail will use the reference numbers to ensure the resumes and cover letters go to the correct person. If you do not note the job reference number in a way that is easy for the person sorting the mail to read at a glance, your application may get sent to the wrong person, or it might just be tossed in the garbage. If there is no job reference number, you will not include a reference line on your cover letter. When writing business letters to apply to an advertised job where the company information has been kept confidential, you can leave this section blank or include any contact information you do have. Do use a name whenever it is possible to get one. If you do not have the name of the person who will be reviewing your resume, you can sometimes use a little detective work to find the correct name. If you absolutely cannot find the correct name of the person who is responsible for hiring, Dear Sir or Madam or Attention Hiring Manager (I actually prefer this one, but that's just a matter of taste) are acceptable when writing business letters. Leave about four blank lines under the employer's contact information. This spacing can be adjusted depending on how your letter fits on the page. Use a couple of extra blank lines if your letter is short, and fewer blank lines if your letter is long. Do not use Mrs. or Miss when addressing a business letter to a woman. Notice the name is followed by a colon not a comma, and not a semi colon. Commas or semi colons are fine after the salutation in an informal letter, but you must use a colon when writing business letters. If you have been given a name that is gender neutral, do not use the title Mr. or Ms. If you address your cover letter to Mr. Chris Smith, and Chris Smith happens to be a woman, you will not make a good impression. Writing the body of your cover letter will be the most difficult part of this job. Because we are concerned with correctly formatting a formal business letter here, I won't go into details about how to write the content of each paragraph of your cover letter. I have written a detailed article that describes a simple, 3 step formula for writing the content of your cover letter. 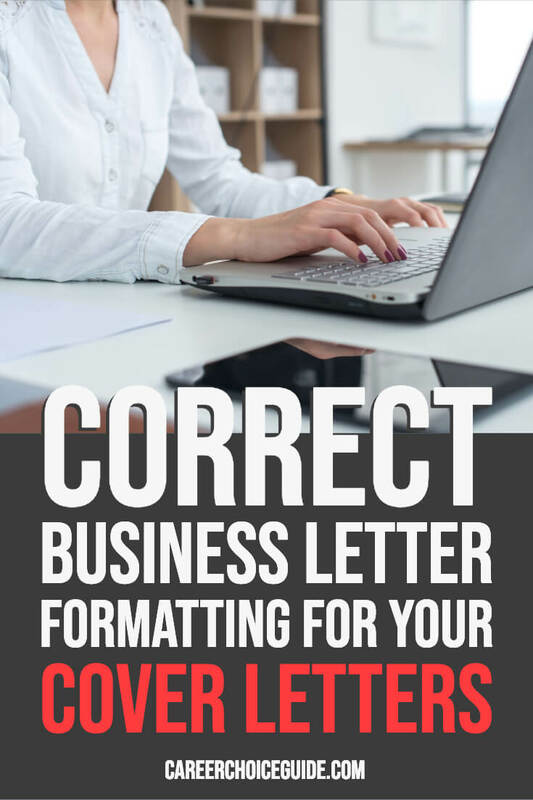 You can click through to that article to learn more about writing business letters that make a great impression on employers if you need help writing the body of your letter. In terms of formatting, in full block style, each paragraph of your cover letter should be left justified. Do not indent the beginning of each paragraph. Also, leave a single blank line between each paragraph. Leave a blank line and type the complimentary close. Don't get fancy with the complimentary close when writing business letters. I've heard of people writing things like "Enthusiastically yours". Something like that looks unprofessional to employers and doesn't make a good impression. If you want to convey enthusiasm (or any other quality) do it in the body of your cover letter. Either sincerely or sincerely yours are safe and acceptable when writing business letters . Notice there is a comma at the end, and the second word is not capitalized. Leave 4-5 blank lines, and type your name. Once you have written your cover letter you must proofread, proofread, proofread! Print a copy of your letter because it is much easier to proofread on paper than on a computer screen. It is best to take a break from writing business letters before you proofread. You'll have a clearer head and be better able to find errors. However, usually when you are applying to jobs, time is of the essence, so you might not have the luxury of waiting to proofread your cover letter. At least take a quick break (go for a walk or have a snack - do something to take your mind completely away from writing) before you proofread your letter. If you can, ask someone who has a strong knowledge of grammar rules to check your cover letter for you. It is surprisingly easy to make simple mistakes, and other people can find your errors more easily than you can find them yourself. Once you are certain your cover letter is error-free, print it on good quality white or off-white paper. Before you send our your cover letter and resume, don't forget to sign your cover letter! If you have said in your letter you are meticulous and detail oriented, and then you forget a detail like signing the letter, you call all of that into question in the mind of the employer. Once you're certain you've written excellent and error-free content, and you've formatted your letter according to the conventions for writing business letters, you are almost ready to submit your resume and cover letter to the employer. 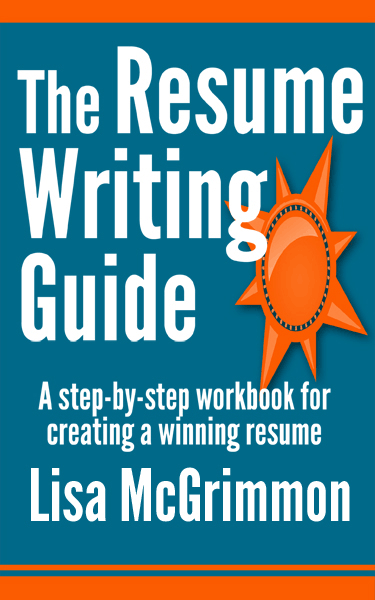 First take a moment to review the guidelines for submitting resumes to ensure you put your best foot forward when you send your resume and cover letter to the employer.